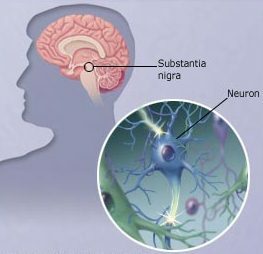 Dopamine is a neurotransmitter, or messenger, that sends messages to the parts of the brain that control movement.Parkinson’s disease is a progressive disorder of the central nervous system, meaning symptoms get worse over time. It is caused when nerve cells in the brain that produce a chemical called dopamine start to break down and die resulting in paucity of Dopamine. Parkinson’ s disease affects men and women equally, usually after age 60. About 10% of people with the disease are under age 40. Most cases occur without a known cause, but others are induced by drugs or environmental toxins. 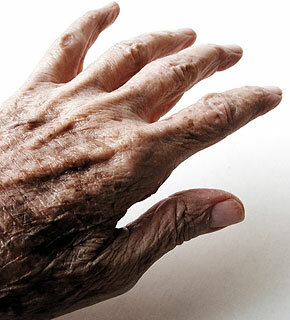 Drugs such as phenothiazines, butyrophenones, metoclopramide, reserpine, and tetrabenazine may cause a reversible Parkinson’s syndrome. Toxins such as manganese dust or carbon disulfide may also lead to disease symptoms. 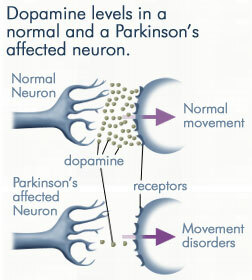 The recreational drug MPTP can cause Parkinson’s by selectively destroying dopamine neurons in the midbrain. Researchers aren’ t sure why some people get Parkinson’ s. The brain starts to lose the ability to tell the body when and how to move. Risk factors include having a relative with Parkinson’s, being exposed to certain pesticides and herbicides, getting older, and lower levels of estrogen in women. Involuntary movement called tremor is most conspicuous at rest, increases at times of emotional stress, and often improves during voluntary activity. It commonly begins as a rhythmic flexing of the fingers or toes, and frequently involves the face and mouth as well. It often starts asymmetrically, affecting one side of the body more than the other. Rigidity typically is uniform throughout the range of movement. In some instances the symptom is described as “cogwheel” rigidity because of the ratchet-like interruptions of passive movement. 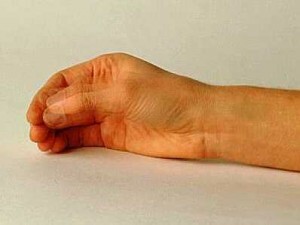 The most disabling feature of this disorder, hypokinesia is a slowness of voluntary movement and a reduction in automatic movement, such as arm swinging while walking. Facial symptoms include infrequent blinking, fixed expression, and a smile that develops and fades slowly. The voice typically is low in volume and poorly modulated. Rising from a bed or easy chair is difficult and standing posture is bent. Patients walk with small, shuffling steps and lack the arm swing that normally accompanies walking. Patients may also have trouble stopping. Medical management is first-line therapy in the treatment of patients with Parkinson’s disease. Medication can be used to treat the chemical imbalance in the brain by enhancing effects of dopamine and/or blocking the effects of acetylcholine. Levodopa can ease most major symptoms of Parkinson’s, including hypokinesia. The most common side effects are nausea, vomiting, low blood pressure, abnormal movements, restlessness, confusion and occasional cardiac arrhythmias. Anticholinergic drugs that block the effects of acetylcholine are more helpful in alleviating tremor and rigidity than hypokinesia, but overall are generally less effective than dopamine-enhancing medications. Among the most commonly prescribed drugs are trihexyphenidyl (Artane), benztropine (Cogentin), procyclidine (Kemadrin), and orphenadrine (Disipal). Common side effects include dryness of the mouth, constipation, urinary retention, confusion and blurred vision. Amantadine is used to enhance the release of dopamine and can quickly improve all symptoms. Unfortunately, many patients fail to respond and the benefits can be short-lived. Side effects are relatively uncommon but can include restlessness, confusion, skin rashes, edema and cardiac effects. Other options include dopamine agonists, such as bromocriptine, which directly stimulate dopamine receptors. The main disadvantage of drug therapy is side effects. The main stay of treatment still is levodopa and the drug gets ‘resistance’ after a few years of treatment. The main side effect of the drug is drug induced diskinesias. As many as 50 percent of patients on levodopa for five years experience motor fluctuations (MF) and dyskinesia. These symptoms are especially common in patients with young-onset (eg, under the age of 50) PD. Patients typically experience a smooth and even response to the early stages of levodopa treatment. As the disease advances, however, the effect of levodopa begins to wear off approximately four hours after each dose, leaving patients anticipating the need for their next dose. Motor fluctuations (MF) are alterations between periods of being “on,” during which the patient enjoys a good response to medication, and being “off” during which the patient experiences symptoms of their underlying parkinsonism. Dyskinesia consists of abnormal involuntary movements that are usually choreic or dystonic but, when more severe, may be ballistic or myoclonic. Dyskinesia usually appears when the patient is “on.” It may occasionally occur in the form of painful dystonia when the patient is “off,” especially in the morning on awakening, when dystonic intorsion of a foot (usually on the side of greater parkinsonian involvement) occurs as a withdrawal reaction because of the long interval without medication overnight. For patients who are intolerant of medications or who experience significant motor fluctuations, surgery can be considered. Deep Brain Stimulation (DBS) surgery is used more often in Parkinson’s disease than any other movement disorder. Depending on age, symptoms, and comorbidities, DBS can either target the subthalamic nucleus or the globus pallidus internus. Stereotactic RF ablation can also be considered but is rarely used since the advent of DBS. Lesions can be considered in the globus pallidus or in the thalamus. DBS therapy is only efficacious for patients with idiopathic parkinsonism and not atypical parkinsonism. 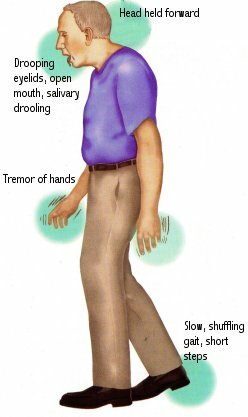 Signs of idiopathic or typical Parkinson’s disease include asymmetric presentation, sinemet responsiveness, slow progression, intact cognition, and lack of autonomic (i.e., incontinence) or cerebellar symptoms (i.e., postural instability). Patients with signs, symptoms, or neuroimaging consistent with ayptical parkinsonism are not surgical candidates for DBS therapy. When successful, DBS therapy reduces motor fluctuations and enables patients to spend more of their day in their best “on” state and to reduce time in the “off” state. Patients should therefore have good motor function and independence during their best “on” state with Sinemet. Patients who have poor function even during their best “on” state are not good surgical candidates. While DBS therapy can help motor function, in patients with cognitive decline, the greatest source of disability often is not motor dysfunction but cognitive dysfunction. 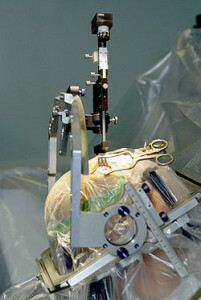 Moreover, because DBS surgery is brain surgery, it can exacerbate cognitive dysfunction. Significant cognitive decline is therefore a contraindication. MRI of the brain should be consistent with idiopathic Parkinson’s disease and not have evidence of atypical parkinsonism (e.g. cerebellar or pyramidal atrophy), significant cerebrovascular disease, or other neurodegenerative disease. Major medical comorbidities, especially hypertension, increase the risk of DBS surgery. Patients should be medically suitable for surgery and have controlled blood pressure to be considered for surgery. Moreover, patients must be able to tolerate a 3-6 hours of awake surgery. Patients must realize that DBS therapy is not a “cure” but symptomatic therapy and that it can take up to 6 months of programming to achieve optimal therapy. Increasing age is associated with greater risk of surgery and decreased benefit of therapy. DBS therapy can still benefit those over 75 years of age, but expectations should be modest and patients should be in excellent general health, have intact cognition, and have good function in the “on” state. Over 70% of patients experience meaningful improvements in their motor function after DBS. Moreover, on average, they gain about 4 ½ hours of good “on time”without troublsing dyskinesias, allowing them to be more comfortable and enjoy life more. Eight-five percent to 93 percent of pallidotomy patients find relief from tremor, and 50 percent or more find relief from rigidity and hypokinesia. Neurological complications are usually mild and temporary, but significant complications occur in 4 percent to 6 percent of patients. They include changes in equilibrium, speech or mental acuity. Mortality is 1 percent or less.